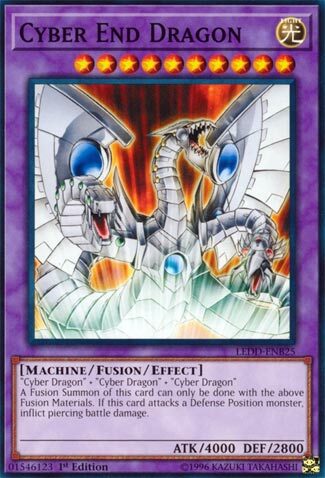 “Cyber Dragon” + “Cyber Dragon” + “Cyber Dragon” A Fusion Summon of this card can only be done with the above Fusion Materials. If this card attacks a Defense Position monster, inflict piercing battle damage. Baneful Cyber Twin Dragon was always better due to the ability to inflict more damage and destroy more targets. Cyber End Dragon has piercing but this is meta dependent on decks which summon weak monsters in defense position. CED still has high ATK and can put out a big chunk of damage. Not worth fusion summoning the normal route, but if it can be brought out with low card expenditure, it can be worth using. Cyber End Dragon is our Throwback CoTD. Iconic monster from the GX days, now Cyber End Dragon is much easier to summon. With so many monsters able to imitate “Cyber Dragon”, CED shouldn’t be too hard to summon. The classic combo alongside Power Bond gives you double the attack and all of the piercing damage. Even without Power Bond, you still can Fusion Summon this boss monster easily and 4000ATK is nothing to scoff at. With Honest at 3 as well, a Cyber Dragon deck could run that Fairy-Type for added attack-boosting power. It lacks protection of itself, but most monsters do and we don’t downgrade their potential do we? In its own deck it could hit the field multiple times during a game and its 4000ATK alone make it a tough monster to bring down. Score: 4/5 Because New Support and Malefic. Art: 5/5 Because multiple awesome artworks. Throwback Thursday this week is the original Cyber Dragon Boss Fusion, Cyber End Dragon. Cyber End Dragon requires three Cyber Dragons as Fusion Material, but this is easy to get around with Zwei, Drei, Core, etc. counting as Cyber Dragon. The Fusion Summon must be done with the above Fusion Materials, so no King of the Swamp and stuff like that, but like I said, Zwei, Drei, Core, etc. can get around this. Cyber End Dragon does piercing and that is about it for its effect. Piercing is epic on a 4000 ATK monster, but sadly Cyber End doesn’t have protection. Back in the day, you had Cyber Stein to summon this guy out, but now Cyber Dragon Nova can when it is sent to the GY thanks to the opponent. Cyber End Dragon is a cool boss monster, even in 2017, but it could use a retrain so it has protection, because three monsters and a Fusion card is a lot to invest in for this guy. I like Cyber End Dragon. I always have. (I’m also fond of Zane, one of the few bright spots from the abysmal GX cartoon). I like Trample, and even though it’s not the most favored or played strategy in Yugioh, it’s fun because your Monsters should be thought of as ‘safe’ in defense position…until they get Trampled. 4000 attack with Trample is awesome. He’s incredibly easy to Fuse, and there are so many ways to bring him out, and the assets Machine and Fusion Monsters have alone. He lacks any individual protection. Or protection at all for that matter, but as far as Fusions go, he’s still powerful. Click here to read even more Yu-Gi-Oh! Cards of the Day!